Renovations - Alca Construction Co. Inc.
Alca Construction Co. Inc. has extensive experience with renovations of housing properties. We have completed about $80 million in renovation work since our inception in 1992. Of those, several have been historic restorations. The project consists of 10 buildings that were completely renovated. These buildings are historic and received historic tax credits. The project consists of 13 buildings that have been completely renovated and one new building. Six buildings were converted from six units to three units. One new building was constructed to match. Two of the remaining six buildings contain 20 and 15 units, respectively. The buildings are historic and earned historic tax credits. 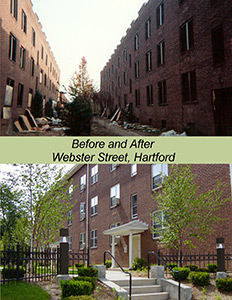 Awards from: The Hartford Preservation Alliance and the Connecticut Trust for Historic Preservation. The project was funded through CHFA with tax credits. A historic school built between 1890 and 1920 was converted to 20 units. This project consisted of multiple buildings that were completely gutted and rehabilitated into 200 units. Renovation of existing offices. This work was completed while the business remained operational. Renovation of historic property into general office space.